These German fabrics are really lovely in their two tones .. this one being - navy and white. The width of these bolts is 57 inches which is great for larger projects - a bonus. 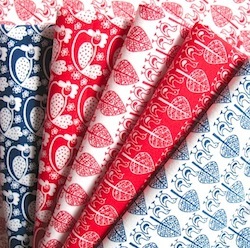 This is a 100% cotton weight fabric and would make the cutest apron or Kitchen blind.... Cute wee chicks in rows in between trees or large leaves .. sooo cute Scale wise the height of the leaf is approx 2cm high.